We’d love your help. Let us know what’s wrong with this preview of Marc Acrich by Marc Acrich. 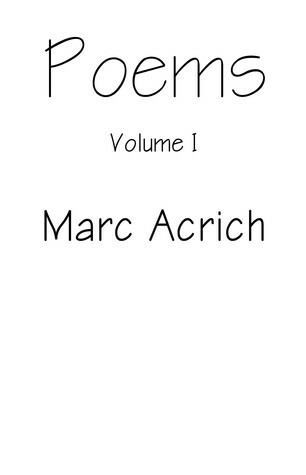 This collection includes some of the earlier work of Marc Acrich, a renowned international poet who has won several writing contests. His writing tackles love, social issues, history, the sweetness of life, and heartaches.With his vivid imagination, Mr. Acrich often will take a news story and somehow get into peoples' heads and write a whole poem about their being, as if h This collection includes some of the earlier work of Marc Acrich, a renowned international poet who has won several writing contests. His writing tackles love, social issues, history, the sweetness of life, and heartaches.With his vivid imagination, Mr. Acrich often will take a news story and somehow get into peoples' heads and write a whole poem about their being, as if he knew them.Mr. Acrich enjoys calling everything he writes "Prose," since sometimes his poems can lean toward short stories.This volume of 50 poems marks the first of several collections of Mr. Acrich's work that will be released in book form. To ask other readers questions about Marc Acrich, please sign up. This is Jim Horn. I have written over 6,000 poems in www.poetrysoup.com What inspired you to write poetry? HARD TO EXPLAIN THE RHYMES COME, BUT IM KIND OF A STORY TELLER THAT IS WHY I CALL EVERYTHING PROSE IM KIND OF IGNORANT WHEN IT COMES TO THE MANY STYLES OF POETRY. =YOU COULD SAY IM SELF TAUGHT I DON'T FOLLOW THE RULES . ALL THIS I DO NOT TO MAKE MONEY ALTHOUGH THAT WOULD BE NICE, IT ABOUT TDONG SOMETHING CRETIVE WITH MY LIFE I CAN'T SING OR DANCE, BUT MAYBE I CAN DO THIS, I HAVE 500 POEMS, ROD MCUEN WROTE 2000 SO IN ALL THAT WORK WE BOTH MUST HAVE SOME GOOD ONES , NO? An interesting collection with a whimsical touch!